Unique, affordable and practical, personalized and customized candy mint tins for all occasions, custom party favors and promotional items. FREE CUSTOMIZATION. LOW PRICE GUARANTEE AND LOW MINIMUM ORDERS. All inclusive -- no extra work involved. Includes custom label, mints/candy, and shrink band for safety and to keep these cool little mint tin party favors fresh. 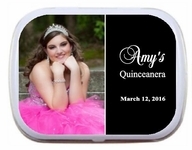 Personalized candy mint tins, custom candy mint tins and photo mint tins for anniversaries, baby showers, baptisms, bar mitzvahs, bat mitzvahs, birthdays, christenings, bridal showers, corporate events, graduations, holidays, christmas, quinces, sweet 16, retirement parties, bachelorette parties, themed mint tins, weddings, special events, etc. Personalized Mint Tins and Candy bar wrappers are just a few of the products we offer. With low minimum orders our products are affordable for any budget. Customization and personalization is always free. One free proof upon request with one free change request proof. Additional proofs will be $15.00 each. Wholesale mint tins and candy bar wrappers are also available to qualifying retailers. Call (502) 548-9791 with any special requests.